The Razer H Series primary cleaner is suitable for vulcanised belt applications where a combination of high performance cleaning and low maintenance belt cleaning solution is required. 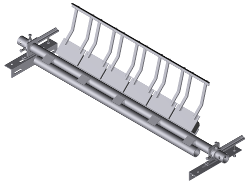 The H-Series cleaner removes up to 80% of carry back materials left on the conveyor belt after product discharge. An all round primary belt cleaner for applications where mechanical fasteners or excessive belt cover damage exists. All H Series Polyurethane cleaners are supplied with a spring adjuster system for continued self adjustment between services. A variation on the Razer H Series polyurethane where cost effectiveness and cleaner performance come together. The Razer H Series econocleaner is designed to reduce capital outlay and ongoing maintenance costs while not compromising on belt cleaner performance. A sturdy primary cleaner with low initial & ongoing maintenance costs. The Razer skalper cleaner offers self tensioning adjustment with fast blade change out for maximum on-site serviceability.